The gentle munch of a cow grazing on fresh grass. A soft baa from a sheep to her lamb. The smell of ripening fruity plums, plump peaches and the tang of apples. If you dream of waking up to the peace and quiet of country life, you might be in for a bit of a shock. There are plenty of idyllic moments but there will also be big challenges if you’re new to farming, livestock and growing. 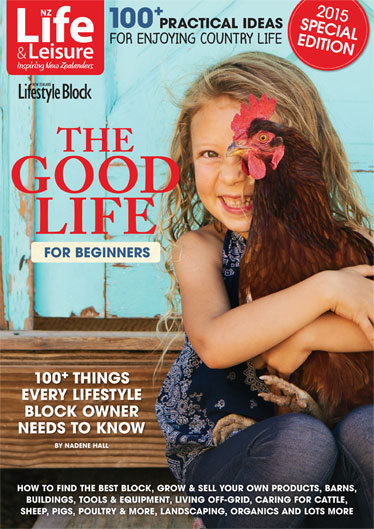 This guide from NZ Lifestyle Block covers 100+ of the basics you need to know before you even buy a block: how to find the best block, grow & sell your own products, barns & buildings, the basics of living off-grid, livestock 101: cattle, sheep, pigs, poultry & more, creating a landscape, going organic, and how to choose the best tools & equipment.